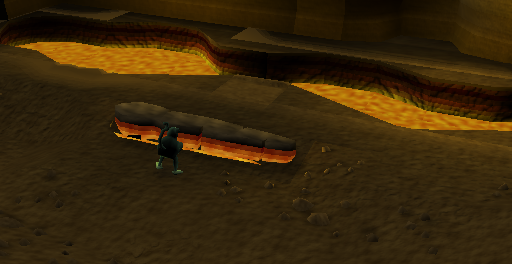 Did you know that there is a Dungeon under the Temple on the Ape Atoll? 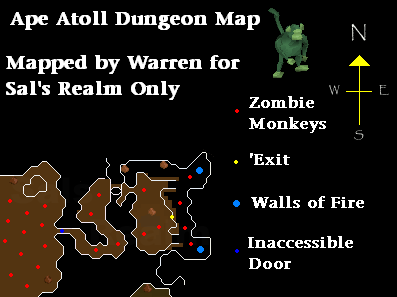 This dungeon is used for two quests, Monkey Madness and Recipe For Disaster. Currently the dungeon is not very large, as there is a locked gate which blocks the passage to the west. 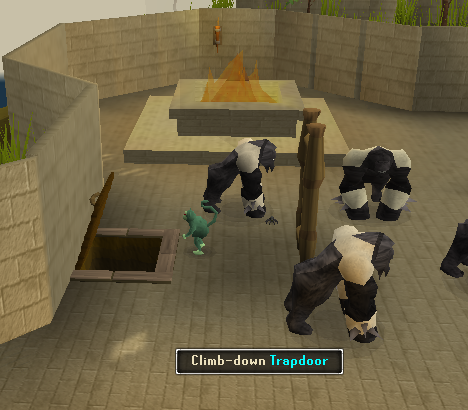 Go to the Temple located in Ape Atoll and enter the trapdoor. This is conveniently the same temple you'd teleport to using the Ape Atoll teleport spell at level 64 Magic and requiring 2 law, fire, water runes, and a banana. 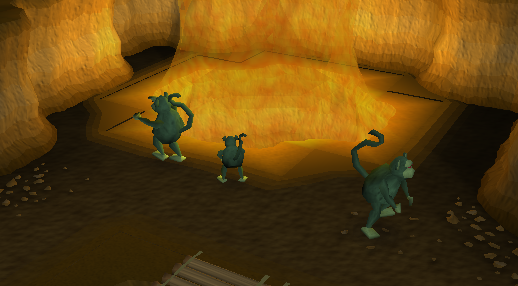 It is advisable to become a monkey using your Monkey Greegree from Monkey Madness so you won't become a target of the local monsters. If you are a Human I recommend to use Protect From Melee as you won't take as much damage, and there is always an altar to Marimbo in the Temple which you can pray at if you are running low on prayer. 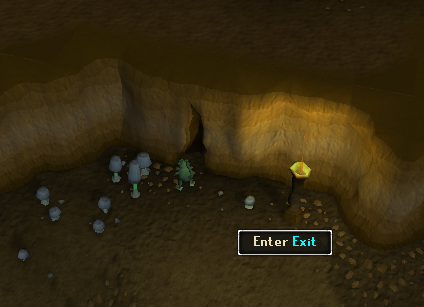 No this is not the way out of the Dungeon, it's a crack that you can squeeze through which leads you to a separate room. 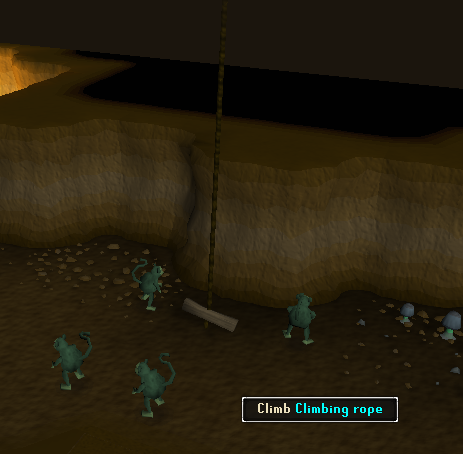 Make sure that you are a Zombie Monkey (like in the picture) as there is lava on the floor which you need to cross. If you are not in Zombie Monkey form when crossing this, you will get hurt badly. There is a Rock in the middle of the room which you use during Recipe for Disaster to cook the King's Meal. This room has no other purpose. There is a inaccessible door if you follow the passage down. Currently this has none known purposes but who knows? Later on it might be used in a new sequel to Monkey Madness! You can still see what is in the other room though. Nothing really apart from Monkey Zombies, but if you look closely you might see a Monkey Skull. Ooo, Spooky.